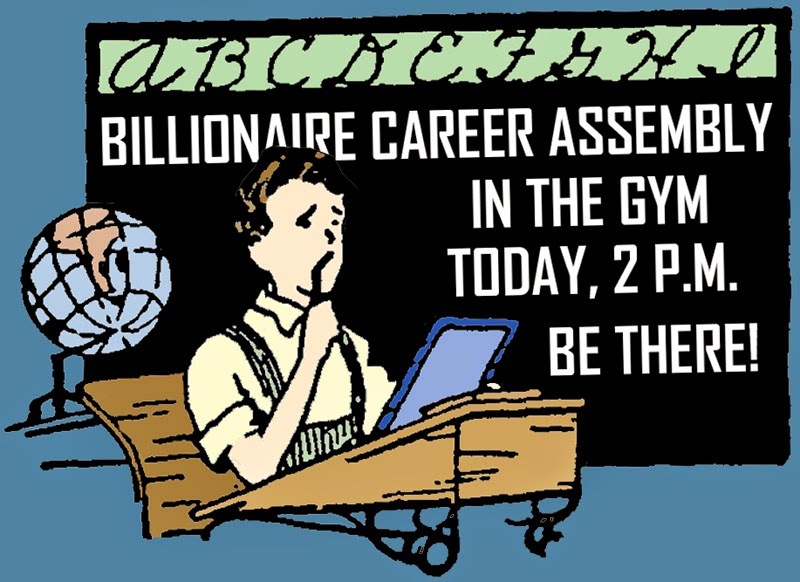 I'm pumping my fist, happy with my performance at the school's Billionaire Career Assembly. It was a panel of billionaires, me included, added to the panel at the last minute. I've only been rich a few days, so I wasn't even expecting to be invited. That said, I believe I scored the most points. I certainly landed more body blows. All in all, I did the best. The first two old-timers were real snobs, refusing even to shake my hand. The third, a younger guy, was nice to me, shaking my hand, then using hand sanitizer. I asked to borrow it. He was gracious to lend it to me, but cleaned it on a handkerchief after I handed it back. In the session, everyone was interested in how we became billionaires. The first guy said he focused on getting a good education and kept very serious goals firmly in mind, working hard to be a success. The second said he worked hard from the time of his first job out of school, saved his money, then invested with a partner and grew their business, hard but rewarding work all the way. The third one's father died, leaving him as a 16-year-old boy to step in and guide the family company through tough times. He said it was extremely hard work, but he stuck to it and made it to the top. That left me, without much of a back story: "Would you believe, I got lucky? I was selling Easter bunnies a couple of Saturdays ago, a billionaire happened to show up, and we hit it off as friends. He gave me a large sum of money. In addition to $2,000 for the bunnies, he gave me $2.1 billion just because he wanted to. My advice: Get lucky." Later, in the Q & A session, one kid took me to task: "My dad says the billionaire's your boyfriend, and it's not just from luck that he gave you so much money. My dad says you 'work hard for your money.' Is that true?" I recognized the kid and I know his dad. I've seen the weasel at the park, "walking the path" as the denizens there call it. I answered him, "If your dad's who I think he is [and he had the same beady eyes and recessed chin], I'd say he's generally in a position to know about that. He speaks as a guy who himself 'works hard for what he gets'--"
Several teachers stepped in to prevent this line of questioning, chanting, "USA! USA! USA!" I raised my arms and called for silence, and promised I could handle the boy's question in a discrete way, while answering it completely. I added, "While it seems to me that teachers are so much younger than when I was a kid, it's interesting to see they haven't loosened up any more." I then addressed the youngster's point: "But to your question, no, at this time I cannot say the billionaire is my boyfriend. He is a boy and he is my friend, which all of you can relate to, but he's not my boyfriend. That's as far as it goes! As far as me 'working hard for my money,' let me just say that's a filthy rumor and not even close to true. At the present time I sleep strictly alone. Or I should say, I sleep alone except for my checkbook, which is on the pillow next to me. "Let the record show, the three other billionaires on this panel openly and brazenly confessed to 'working hard for their money,' so compared to them, I would say I'm quite the moral person. Whoever they may have had relations with, and how often, and whatever else may or may not have gone down in the privacy of their bedroom, motel room, or, yes, even the park, this is decidedly not the time or place to discuss it." Of course each man had his own secrets and was quick to exit the stage as soon as the principal thanked the group. Off to more "hard work," presumably. I didn't follow them, so we'll never know the full disgusting story. It is, however, shameful that any of them were even considered for an event of this nature, exposing themselves and their tawdry pasts to our youngest and most vulnerable citizens. The innocence those kids have, that is something we must and we will maintain. From this day forth, and forever, let those who would take advantage of their innocence know -- and in no uncertain terms -- the rest of us will not stand for it. Instead, together we will rise up, protecting one another, as well as our most cherished and honored traditions. Several kids came down, asking for autographs on one dollar bills, fives, and anything else they had. A couple of the little bozos wanted autographs on college textbooks on Advanced Economics and the like.